With a Wraith horde on his doorstep, it did not take Forge long to backtrack and agree to save the planet from the menace that the Dire Wraiths represent. First though, he and Rom need to defeat the ones that confront them now, to which they do of course, but an even greater battle awaits them and it is one on that will take place on two fronts, that of the Wraiths themselves and the impending Worldmerge. It seems like a fight they could never win, but our heroes are determined, especially as the fate of all humankind rests in the balance. The relationship between Rom and Forge is not an easy one for whatever reason and yet there is a respect between them. It might have been born of the situation, but such as it is, it must endure for all their sakes. The Wraiths are quite tenacious in this particular issue, knowing that this might be their last push to take over the Earth and defeat the Spaceknight once and for all and so we find them more vicious than ever, doing what it takes to come out victorious. 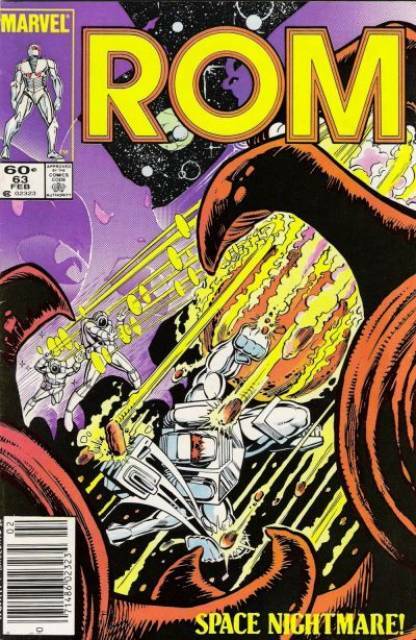 Bill Mantlo also gives us a look at Brandy Clark, the woman who loved Rom enough to become a Spaceknight herself and fight alongside him until her family was slain, she went insane and a battle with Hybrid returned her back to the woman she was. We find Brandy not dealing with the situation very well and if she does not go completely mad from being unable to deal with the grief, one can only guess at what the future holds for her and for her relationship with Rom. All that needs to happen is for the two of them to survive their respective battles before they can finally be together.